A woman is dead after she tried to cross a busy street, and the facts surrounding her death are typical of many pedestrian-auto accidents in Tampa. The wreck occurred on Belcher Road not far from the 75th Street intersection. 23-year-old Jorge Quintana, of Kenneth City, was southbound on Belcher when his Toyota collided with 29-year-old Jessica Pepin, of Clearwater. Witnesses stated that Ms. Pepin began running across the road in the moments just before the impact. She was declared dead at the scene. Police do not suspect that Mr. Quintana was impaired and he is not expected to face criminal charges. 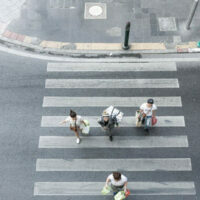 The majority of pedestrian-auto accidents occur outside marked crosswalks and in non-intersection areas, so much like the tortfeasor in the above story, the vehicle is often travelling at full speed at the moment of impact. There is a definite relationship between vehicle speed and injury severity in vehicle-on-vehicle collisions. But assuming that all the occupants are properly restrained and all loose objects, such as cellphones and backpacks, are stowed away, high-velocity crashes are normally survivable. But pedestrians have no such protections, so there is even a closer relationship between speed and injury in these incidents. In fact, the pedestrian serious injury rate is less than 25 percent if the vehicle is travelling slower than 23mph, and over 90 percent if the vehicle is moving faster than 40mph. Even if the tortfeasor is clearly at fault for the collision, legal responsibility for damages is not always easy to establish, because there is a difference between an opinion of fault at the scene and proving liability in court. Unexpected Event: Tire blow-outs, hood fly-ups, and other such events are truly unexpected, because they are so rare. On the other hand, large potholes, stalled cars, or jaywalking pedestrians are not unexpected, because they are very common and drivers should be ready to face these situations. Reasonable Reaction: It appears that the driver in the above story pulled over to the right and stopped, which is a reasonable reaction in that particular instance. If the legal test does not apply, defense lawyers often try to leverage the idea of the sudden emergency defense into the contributory negligence rule. If the victim was not entirely at fault for the accident, the victim was at least partially at fault, they argue. Florida is one of a few pure comparative fault states, so the judge apportions damages strictly according to fault as determined by the jury. Therefore, if the jury divides fault 50/50, the tortfeasor must pay half the victim’s damages. In many other states, the tortfeasor must be mostly responsible for the crash in order for the victim to collect a proportional share of damages. Pedestrians risk serious injury just by crossing the street. For a free consultation with an experienced attorney in Tampa, contact The Matassini Law Firm, P.A. We do not charge upfront legal fees in personal injury cases.